An economy in the ditch is tough on all job seekers, but particularly so on new college graduates. New grads likely went into their 2-4 year programs on the wings of an expanding economy. Most are now falling fast as the economy has retrenched and jobs hard to come by for those with little to no practical experience in their chosen fields. But there are jobs out there, albeit few. And they will go to somebody. To make sure you’re one of those somebodies, begin by making your new graduate resume the best it can be. 1) Choose Targeted Over General Resume. The days are gone when the new grad can write a ‘one-size-fits-all’ resume with a general objective statement, a bunch of overused resume cliches and a chorus line of part-time jobs, each given equal weight whether relevant or not. A job search in this environment demands a targeted approach. Every resume you submit to a job opening needs to be targeted to that position; your objective (if you have one) should mention that position by name, and every ingredient in your profile section needs to drive home the point that you are the right person for that job. Even the details under your education and experience sections should be adjusted to reflect maximum compatibility with the targeted job. And yes, that process should be repeated for each job you apply. More work? You bet. Welcome to a recessionary economy. Your profile (or summary) is located either in place of, or directly beneath the objective. Your profile is a brief section (two or three lines, maybe three bulleted achievements beneath those lines) giving you the opportunity to highlight the skills and training that best qualify you for the position at hand. Note that this section might change slightly with each new targeted resume, as you subtly adjust your skill set to match each job’s qualifications. 3) Highlight Your Education. For most new graduates, their education is their calling card. Situate the education section directly beneath the profile. That is, unless you’ve held at least one full-time job for a year or more, and that job is particularly relevant to your objective. In that case, place the experience section above education in the lineup, as you will want to emphasize and elaborate on that job. 4) When To Use GPA. Mention your overall grade point average if it’s 3.5 or higher. Indeed, emphasize that fact on your resume. On the other hand, if your GPA is not so good, especially anything less than 3.0, leave it off the resume entirely. Mention your major GPA if it’s 3.5 or more, or higher than your overall. 5) Courses and Activities. List individual college courses, campus activities and such in indirect proportion to the strength of your experience section. In other words, if your experience is lacking big time, elaborate on specific courses completed, campus activities, club memberships, offices held, etc. Conversely, downplay most or all, and leave some off entirely, if you’ve held one or more jobs that add heft to your objective. And if you’re totally dependent on a list of course work to fill up space on what would otherwise be a desert moonscape of a resume, try to show how the knowledge acquired from these courses transition to your stated objective, and the needs of the employer. As a new graduate, you have some things going for you. You have a good academic foundation in your selected profession, you’ve demonstrated the fact that you’re trainable, and odds are you’re more technologically savvy than members of the previous generation. And you’ve got a fresh perspective and a can-do attitude (in other words, you haven’t yet been crushed under the jackboot of cynicism and apathy). Make sure your resume looks equally good, and get yourself out there. 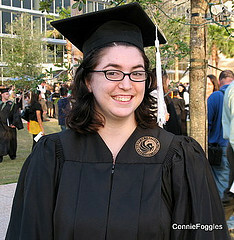 Should new graduates consider using a professional resume service? “In this tough job market – yes,” says former recruiter David Alan Carter. “But make sure the writers are certified and they offer an interview guarantee.” Carter has put together Resume Service Reviews of the Web’s most popular writers at the website TopResumeServices.com, reviewing quality of workmanship, spelling out their pricing, and giving each a star ranking. What Font Size Should I Use For My Resume?